Description: 1031 arrives from Boston. Description: Inbound at Beaver St. Description: Outbound 039 speeds through South Weymouth. 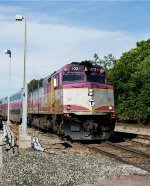 Description: MBTA 1031 leads a westbound train through CSX's Worcester yard. The train is about to stop at Worcester Union Station. Description: F40 1031 prepares to depart with 043 for Kingston, as I take my last pictures before I board. Description: 1031 gets the green eye to accelarate out of South Weymouth with outbound 043. Description: MBTA 1031 on the tail end of an inbound commuter train with 28 axles. Description: Southside equipment transfer is ready to go at Boston Engine Terminal to head west to Worcester via Ayer. Description: HSP-46 Test Train gets overtaken by train #2309 at Prison Point. Description: pulls out of Union Station.